We’re not always used to the Auburn Tigers being major contenders in the NCAA basketball tournament versus being a dominant force during the football calendar in the fall. Before the last two seasons, their last NCAA Tournament appearance was all the way back in 2003, and the school has never made a Final Four. However, the Tigers earned a #5 seed after a stellar season this year and they have at least one pretty famous basketball alum – Charles Barkley. 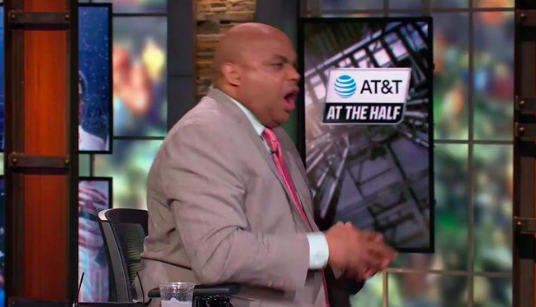 Barkley was in the studio for what was easily the most dramatic game in Thursday’s early slate of NCAA Tournament games, Auburn’s matchup with #13 seed New Mexico State. It looked like Auburn had the game won but a furious finish after a missed free throw saw New Mexico State race down the floor down by two points with a chance to win or send the game into overtime. Incredibly, the Aggies turned down an open layup, got fouled shooting a three pointer, missed two of three free throws, then after the ball went out of bounds missed another game winning attempt as time expired. If you think that was exhausting just reading it, this was Barkley’s reaction as he rode the Auburn roller coaster. It won’t get any easier for Sir Charles and his stress levels. Auburn will face off against Kansas in the second round Saturday.